Make Christmas & New Year's Parties Pop with Confetti Cannons! Ah, the holiday season is upon us and that means it’s time to celebrate. This time of year is filled with parties at work, at friends’ and family's homes, and of course in your own home. There are so many ways you can make your parties that much better. There are secret recipe foods, the right beverages, music, dancing, or simply sitting down with close friends to enjoy time together. Why not add a touch of magic and whimsy to the party with confetti cannons? When it comes to Christmas parties, nothing is more likely to add an extra touch of fun and magic than giving your guests party confetti cannons to set off. At Wedding Sparklers Outlet we have a great selection of confetti cannons for you to choose from. Our multi-colored confetti cannons measure 18 inches long and 2 inches in diameter. The paper inside of them is fully biodegradable so even if your guests take them outside to keep the party going, the confetti will wash harmlessly into the ground the first time it rains or when the snows melt. Why not place one of our confetti cannons at each place setting at the dinner table. Just make sure everyone understands they shouldn't fire off the cannons while there is still food on the table. The confetti is non-toxic but might make your meal a little more colorful and interesting to look at. Of all the celebrations and parties you are likely to host over the course of the year, there is one that tops them all! New Year's Eve. This is the one night of the year you can truly let it all go. It's a time when adults get together over drinks, loud music, snacks, and plenty of good old-fashioned partying. Maybe this year you have planned a costume party, or silly hats and noisemakers. But, then this is just about the same thing you do every year. So why not go all out and pick up a large supply of party confetti cannons?! Let's set the scene: it's about ten minutes until the ball drops in Times Square, the party is in full swing and everyone's champagne glass is filled. All that is left is for the clock to wind the old year down and kick start the new year. Now, you hand everyone in the party a confetti cannon and watch the excitement continue to mount. Five, four, three, two, one, HAPPY NEW YEAR! Everyone in the party fires off their confetti cannons showering the entire party in a massive cloud of multi-colored confetti, as they engage in the kiss that "Lasts a year long." What a great way for everyone in your party to see in the new year! 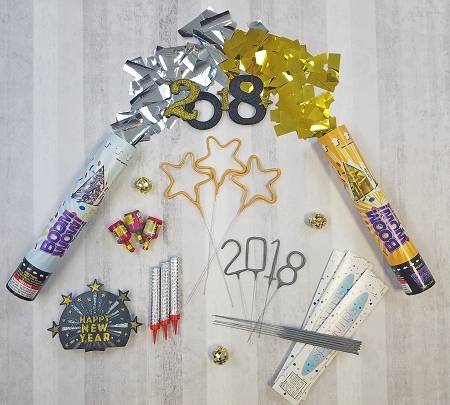 If you are interested in buying confetti cannons for your Christmas or New Year's Eve party, visit us at Wedding Sparklers Outlet and take a look at our great selection of party confetti cannons. We have several different colors for you to choose from.